Lois Szymanski came to Delmar! 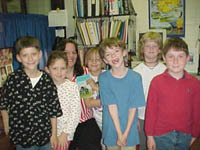 During the 1999-2000 school year Mrs. Lois Szymanski agreed to participate in the Authors in Residence program at Delmar Elementary School. 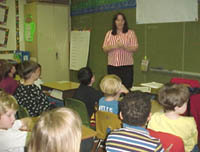 Six students in Mrs. Weeg's second grade computer class wrote stories with the help of their online mentor, Mrs. Szymanski, who has written many children's books. The project was very successful and enjoyed by all. The students were filled with excitement when Mrs. Szymanski wrote and said she was coming to Delmar to meet them. 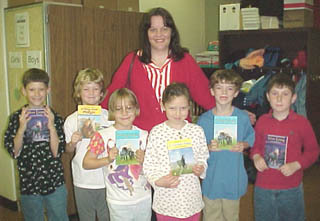 Pictured here are the six students who worked with Mrs. Szymanski. They are proudly holding the autographed books she gave them during her visit. Mrs. Szymanski visited Miss Elliott's second grade class and talked to them about her love for horses and how she writes her book. She says it is important to exercise our "writer's muscle" because this will help us to become better writers. She told us that she rewrites her first drafts many times before her books are ready to be published. 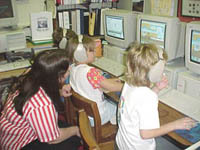 Mrs. Szymanski helped Stacey with her spelling in the computer lab. When we are writing stories it is important to keep writing and not to let spelling worry us. After we are finished with our ideas we can always go back and make corrections. The students showed Mrs. Szymanksi how they write in the lab using StoryBook Maker. Here they have chosen a setting and are writing a sentence about a picture on the screen. Mrs. Szymanski was pleased to see how the students can use the computer with ease. As our visit with Mrs. Szymanski was ending and the students gathered around her for a picture. Stacey found it hard to take her eyes from the new book that her mentor friend brought for her. How special it is to own a book that was given to you by the author herself!